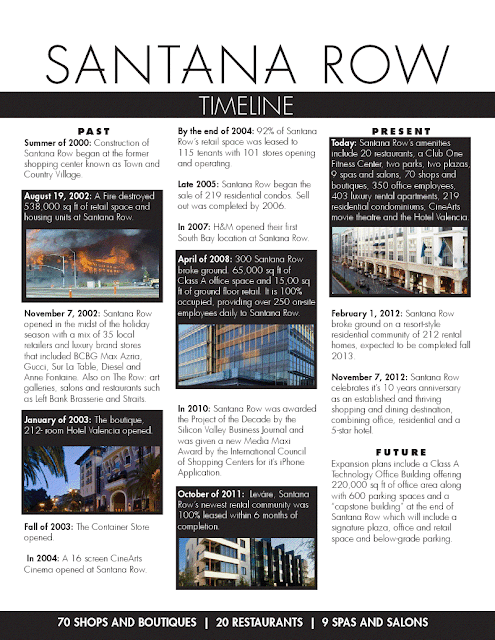 The 10 Year Anniversary of Santana Row is coming up this November and their marketing staff was kind enough to send over a historical timeline. Santana Row has become one of, if not the most successful mixed-use project in the world and that is surely something for us to be very proud of. Particularly interesting in the timeline below is the part labelled "FUTURE." We knew about the 220,000sqft office building and 600 parking spaces, but what is new to me is the "Capstone Building" at the very end of the Row which will feature a plaza, additional retail, more office space, and underground parking. This will be visible from just about any point along the main street, so I'm expecting an impressive building to cap off one of the most active streets in San Jose. Please click the image below to expand it (and make the text legible). A 769 unit apartment project on River Oaks Parkway in North SJ is starting it's second phase. This will add 289 new units to the 280 that already under construction and are expected to start leasing in May 2013. No news on when the third and final phase is estimated to start. All of the units are either studios, 1 bedroom, or 2 bedrooms. The entire project is going to cost $192M. This along with the many other massive apartment projects in the area will help us get toward the density we need in North San Jose in order to justify pedestrian-oriented retail and expanded transit. A10 Networks is an application networking company that was recently named the 2nd fastest-growing private company in Silicon Valley. They have just moved into a new North San Jose Headquarters at 3 W. Plumeria Drive. The office is 79,800 sqft--double the size of their previous home--and with the new space comes additional headcount. They are planning to hire over 100 new workers over the next year. It's always great news to hear about additional workers in San Jose, especially denser areas with transit like North San Jose. The private sector in the San Jose area is on fire right now. I have done quite a few Saturday stats proclaiming how our salaries have nudged out other regions such as New York and San Francisco. However, today I'm not just going to tell you that our salaries are the top in the nation... no, I'm going to tell you that they are higher by a substantial and perhaps even dramatic margin. For private sector jobs, average pay in New York is $63,400. For our neighbors in San Francisco pay sits at $64,800. The runner up, Bridgeport-Stamford, Connecticut, raked in $76,700 per private sector employee. San Jose? A staggering $85,100 average salary per private sector worker. This is substantially higher than last year's record breaking number, which was also set by San Jose: $75,800. Now the challenge is going to be keeping as much of that money as possible invested in San Jose instead of having all that wealth being handed to other communities outside of Santa Clara County. A hot San Jose greentech company that specializes in printing solar sheets that are as thin as aluminum foil has just grabbed a cool $70M in their latest round. Not only are they producing the thinnest solar "panels" around, but they also claim to have the least expensive in the world. Perhaps one day you'll even see these types of panels outside of the residential/commercial energy space. I could see wrapping handheld electronics, laptops, cars, and even airplanes with this tech. On Saturday, August 4th Alexandra & The Starlight Band will perform at San Jose’s Streetlight Records alongside San Jose local Stock Foto. The show will be in support of Alexandra’s latest release, Alexandra & The Starlight Band, which already has critics buzzing, hailing the gritty & sultry songstress as the new, 21st century Queen of Rock ‘n’ Roll. Along with CD, Alexandra & The Starlight Band is being released in a never-before-made combination of clear vinyl/rainbow glitter, each painstakingly custom made & hand numbered. Entirely crowd-funded, the release garnered an overwhelming response on the creative platform Kickstarter—resulting in over 205% funding and the limited edition 7” being nearly sold out, months before its release. For this recording, Alexandra Starlight worked at Henson Studios in Los Angeles alongside Bob Cutarella (Paul McCartney, Alice Cooper, Madonna, Joss Stone, Keith Richards), engineer Paul LaMalfa (Brian Wilson, Colbie Caillat, Sheryl Crow, Loretta Lynn, Mariah Carey), Kevin Mills (Michael Bublé, Tom Morello, Céline Dion, No Doubt, Bruce Springsteen, Velvet Revolver, Gwen Stefani) and Lena Horne’s former band leader, Lou Forestieri (Tori Amos). Sonically, the 5 song EP presents a fresh spin on classic American music; hearkening back to the golden period in the 1970’s when rock ‘n’ rollers were looking to the sounds of Motown, R&B, funk and soul for inspiration. In the swinging “Without My Sunshine,” Starlight muses on the proverbial calm after navigating a stormy sea of heartache, with a bittersweet sense of gratitude, set to the sounds of gospel backing vocals and a classic Stax Records style horn section. Yet Starlight stands strong and never plays the victim; in the funky & heavy-hitting “T.T.M.F.” she trash-talks her two-timing ex-lover, positioning herself as the victor in her own superhero-esque survivor theme song. The result is a collection of songs that are at once triumphant and vulnerable, introspective and searching, strong and sassy. Alexandra Starlight’s live show matches the intensity of the songs, earning her a reputation as an artist to watch. She has played alongside artists such as Semi-Precious Weapons, Kate Nash, Trixie Whitley, Intronaut, Jhene Aiko, Vanaprasta, Harriet & Black Math Horseman, at notable venues such as The Troubadour, Hotel Café & The Satellite. Earlier this year, she performed at SXSW for a showcase curated by the Miles Davis family. 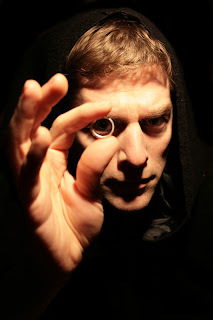 Last night my husband and I attended Charles Ross' show, "One-Man Lord of the Rings" - an intense, energetic, mind-warping adventure through the full Lord of the Rings trilogy now playing at The San Jose Repertory Theatre. Last year we saw Ross' "One-Man Star Wars", (actually, our second time seeing it), and loved it and were excited to hear he had another show and would possibly be coming back to San Jose to perform it. Anyway, because of that poll I felt a wee bit better. And, mind you, earlier in the day my husband, Adam, gave me a complete rundown of the trilogy/story and that HELPED A LOT. That said, because this show is much different than others I've reviewed before (one actor, no set, not a musical, no costumes..etc) I'm going to interview my husband to get his take on the show. His "credentials"? He's a huge fan of LOTR; he's read the books, watched the movies endless times, AND attended the all-day theatre screening of all extended versions of the movie. Also, as Ross' show was going on, I'd glance over at Adam and he was in full crazy laughter mode. This show was soooo for him. Q: What are some points of the show you found particularly entertaining? A: His breaks of the 4th wall were very funny and I liked his mentioning of changing the discs in each movie. His interpretation of Legolas was the funniest (brushing long hair, pinning hair up, blow-drying hair.) His depiction of Denethor (extended eating scene) was hilarious and he had a few impression/mentions of other pop culture movies that was a great touch. Q: Best geeky moment during this show? Q: Is there anything you didn't like or found difficult to understand about the show? Q: Final thoughts on the show? A: It was a very funny and entertaining representation of all three movies. Although to fully appreciate and follow along with the shows, I think one must have seen the extended versions of the DVD's. So there you go! I really enjoyed the show and was laughing throughout the entire thing. Charles Ross performs as 42 characters (42!) in a 60-minute show. Insanity! Oh and get this - he performed it infront of Sir Ian McKellan (Gandalf) and he loved it! Grab your tickets FAST as there are only SIX shows left! Think Bigger San Jose has a great post about Downtown San Jose needing smaller spaces. Most of the available retail Downtown is gigantic, ranging from 1,500 sqft all the way up to 10,000 sqft. This is not very well aligned with the demand right now in the local retail space. Mark cites Japantown as a San Jose retail success story because it has availability of smaller spaces as "cozy" as 300 sqft. 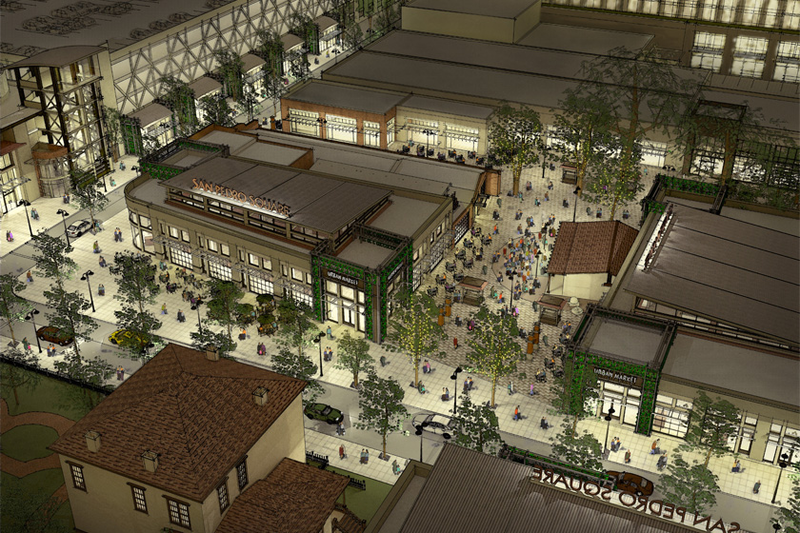 The one example of smaller retail space Downtown is The San Pedro Square Market, and it has been a raging success. This also extends to residential living. The cost of housing in San Jose is astronomical, especially for students and young professionals. We need smaller residential spaces Downtown along with appropriately scaled down rents. I'm totally aligned with Mark on this one and if I had the money and resources to put up a high-rise of my own up right now, the top item on my list would be a Micro-condo building. None exist in the South Bay and it would open up the housing and rental markets to a whole new group of people and possibilities. To read Mark's post in Think Bigger San Jose, click here! Sunday, Dec. 9th will be the first Silicon Valley Santa 5K run. It will start in the late afternoon so that participants can end their race among all the Christmas lights Downtown. 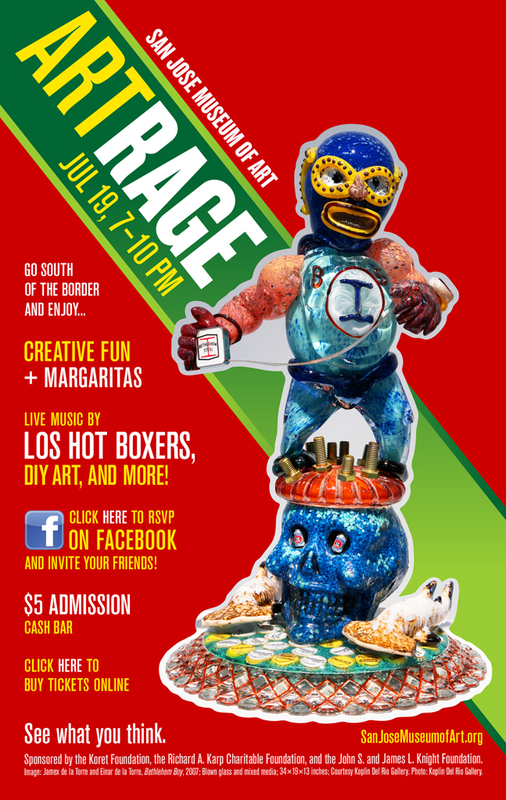 The Aug. 3 and Sep 7 South First Fridays will feature an urban faire to go along with the art walk. A joint SJDA and 1stACT Silicon Valley "Small Wonders Fund" will provide seed money for up to 18 new Downtown activation ideas between June 2012 and June 2013. Cre Paris is now open at the San Pedro Square Market. Cafe Bon Terre (formerly Whipps) will continue to server frozen yogurt but has also added crepes to the menu. Zenon's Place is now open at 167 E. San Fernando and will serve Peruvian and Mexican Dishes. Dosa & Curry Cafe is now open at 345 S. Fourth St.
Third and Fourth streets are being repainted with "buffered" bike lanes. 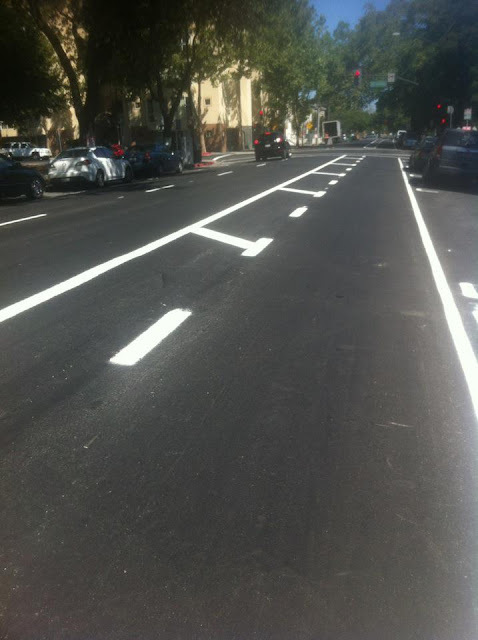 Almaden, Grant, 10th St., and 11th St will be getting new bike lanes as well. San Fernando St. will be getting a green-painted bike lane. A Bike Share program featuring 15 stations and 150-200 bikes will be kicking off this fall! 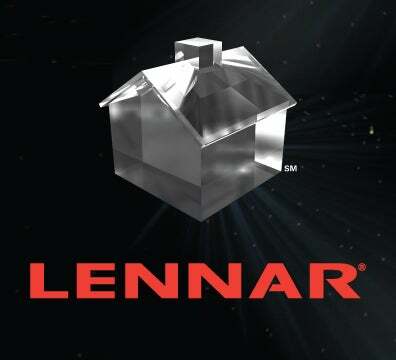 Lennar has purchased 40 acres or property east of Cottle Road and Highway 85 in South San Jose. The plan is to build a whopping 840 homes across six different communities, all to be completed by 2014. There will be a mix of detached homes, townhomes, and flats ranging from 800 sqft to 2,500 sqft. In addition to this project, up to 2,000 other homes could be built in adjacent parcels. To service all of these new residents, a 320,000 sqft retail space anchored by Target and Safeway is set to break ground later this year. Before you post in the comments: "Why are they building in South San Jose? This should be in a transit village!" ... let me say that this development will have access to both Lightrail and Caltrain. Also, any development news is good news at this point. Valin is a process solutions company whose light manufacturing business is growing and they are in need of more space. They are going from 32,000 sqft on 555 E. California to 56,840 sqft in San Jose's International Business Park (1941 Ringwood). Valin has revenues of $153 million and has grown its workforce from 150 employees in 2008 to 237 employees today. The San Jose Jazz Summer Fest is Coming! New incentives for high-rise construction have been launched [and they appear to be working], specifically lower construction taxes, commercial-residential building taxes, park fees, streamlined permits, and several other perks which would apply to the first 1,000 units that break ground before 2013. 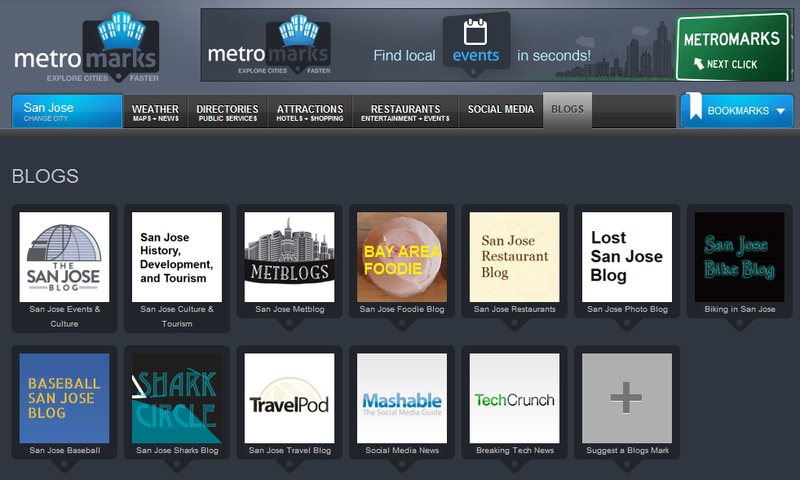 SJDA launched a targeted marketing campaign for www.liveandlocalsj.com, which highlights live music venues and performers. More than 20 Downtown locations present music on a regular schedule and there are 40 that host music seasonally. St. James Park will host the Blues Fest on July 14 from noon to 8pm. Downtown Doors is expanding to 65 locations Downtown, brightening up the streets with art from local high school students. Blush Raw Bar & Lounge is open in the San Pedro Square Market, serving sushi and "slush" drinks. The Sliding Door has opened at 355 S. First, selling moving doors, walls, and room dividers in various finishes and glasses. KQED has a new home at 50 W. San Fernando. Parque de los Pobladores in SoFA is being expanded thanks to a $500,000 grant from ArtPlace to turn the park into an outdoor living room for the arts. Greyhound's Express service has expanded into California and San Jose is one of just a few cities selected to have these new premium routes. The highlights of the new service are very few (if any) stops, guaranteed seating, free WiFi, power outlets for every seat (! ), extra legroom, and leather seats. I'm not sure how this next part is possible, but trips start at $1. DALLAS, April 18, 2012 /PRNewswire via COMTEX/ -- Greyhound today announced that Greyhound Express -- the company's premium, non-stop service -- will be expanding to the West Coast starting May 2. Next month, Greyhound Express, which launched a little more than a year ago, will expand into California as well as add new routes in Texas, further building on the most recent success of its largest expansion since its inception. Today's announcement introduces 66 new city pairs and 10 new markets to the growing Greyhound Express network, which is the largest network of nearly 700 potential direct-service intercity pairs. Tickets are now on sale with every-day fares starting at $1 at mygreyhoundexpress.com. Greyhound Express is coming to 10 new markets: Los Angeles, Oakland, San Francisco, San Jose, Bakersfield, Fresno, Modesto, Stockton, Sacramento and San Antonio. Since introducing Greyhound Express in December 2010, Greyhound has expanded to nearly 70 key markets across North America and has seen an impressive 21 percent increase in overall ridership, with nearly 2.2 million customers experiencing the premium service. Aiming to introduce customers to a wholly new, better travel experience, Greyhound Express combines affordable prices with amenities usually found in more expensive travel. "Just in time for summer travel planning, Greyhound Express is now available in five major regions of the United States. Families, students and other adventurers who have been hesitant to book travel due to high fuel prices or increased fares on other modes of transportation, can find relief knowing our affordable, premium level of service can now be found coast to coast - something our competitors simply don't offer," said Dave Leach, president and CEO, Greyhound. "This expansion is a direct result of customer demand and our customers have shown us that they love the value and premium amenities Greyhound Express offers." Greyhound Express continues to be an innovative leader in the industry, providing modern, environmentally friendly buses equipped with amenities such as free Wi-Fi, power outlets, leather seats, reserved seating and extra legroom. Customers can buy their Express ticket online to take advantage of discount pricing, print their ticket at home, or pick it up at a self-service ticketing kiosk, and know a guaranteed seat is waiting for them. Additionally, Express customers can relax in private waiting areas in select locations, protected from the weather, with a dedicated guest services specialist available to provide an extra level of customer assistance. All tickets are nonrefundable. Greyhound Express provides non-stop service between major cities, originating from Greyhound service hubs including New York; Washington, D.C.; Chicago; Atlanta; Dallas; Calgary, Alberta and now Los Angeles. For those who need long-distance connections, stations along Greyhound Express routes allow travelers to easily connect to an established network of more than 3,800 Greyhound destinations throughout North America. For fare and schedule information and to purchase tickets, visit mygreyhoundexpress.com. 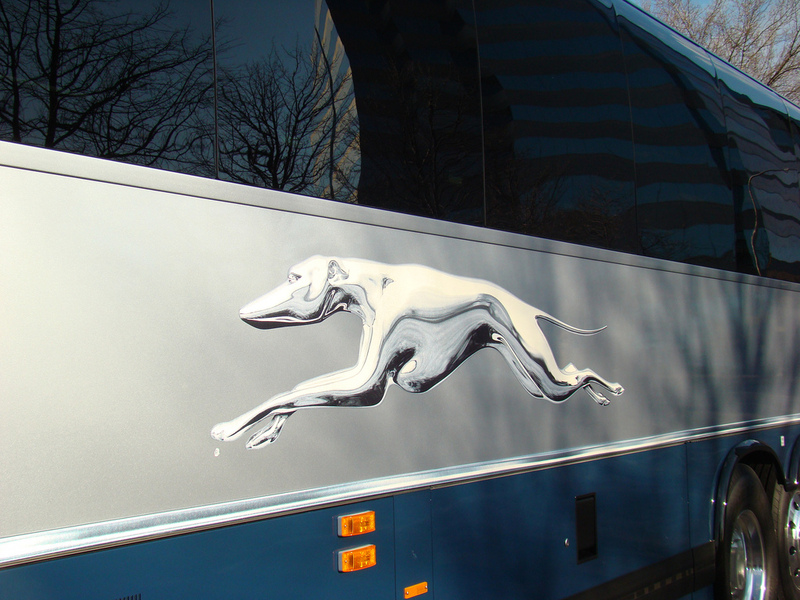 Greyhound is the largest North American provider of intercity bus transportation, serving more than 3,800 destinations across the continent. 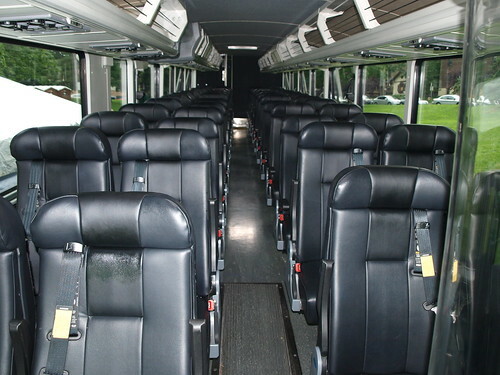 The company also provides Greyhound Package Express (GPX) and charter services. For fare and schedule information and to buy tickets call 1-800-231-2222 or visit the website at www.greyhound.com . For the latest news and travel deals, follow GreyhoundBus on Twitter at http://twitter.com/GreyhoundBus and "Like" us on Facebook at http://www.facebook.com/GreyhoundBus . New Bike Lanes are a Go! It looks like the new protected bike lanes on 3rd and 4th have been added! Just in time for our new bike sharing/rental program coming this fall. Other bike projects scheduled this year for Downtown include adding a "green-painted" lane down San Fernando and new lanes on Almaden, 10th Street, and 11th Street. Thanks to Luke for sending this in. San Jose is part of a contest to be the "Coolest" California City along with 9 other cities. The contest is essentially won by being green and trying to save as much energy as possible. The prize is $10,000 and of course some bragging rights. In order to participate, all you need to do is register for the program by clicking one of the links below. In addition to helping out the city, you will also be able to take advantage of substantial local discounts as a "thank you" for participating. So it's a win for everyone: the city, you, and the environment! Join Green Energy Match, the City of San Jose’s free program for saving energy. This program provides online software that analyzes your home energy use and makes simple energy-saving recommendations. • Help San Jose Win — San Jose is competing in the Cool California Challenge and the City needs you! Go to www.greenenergymatch.org to sign up. The program is available only until the end of July. Or call 800-314-5997. This program is sponsored by the City of San Jose, Silicon Valley Energy Watch, the Bay Area Air Quality Management District, WattzOn and Acterra. Two New Downtown San Jose High-Rises May Break Ground This Year!!! I have some epic news today. Downtown San Jose may get not one, but two residential high-rises breaking ground this year. We have all seen the impact that that current 4 towers have had on life Downtown. There are more people walking around at any given day/time and both restaurants and retail have continued to grow over the last couple years. Another 1,000 residents on the street should be enough to create critical mass for Downtown's main districts. Tower #1 is rumored to be The Carlysle in San Pedro square right between the San Pedro Square Market and Axis. Given the ridiculous success of the still very incomplete Market, this is going to be a hot location. This will be a 21-story apartment tower with no planned retail on the ground floor. Usually I would be disappointed with the lack of ground retail, but with San Pedro Square across the street I don't think it will be missed. 12,000 sqft of retail! (Thanks for the correction Santa Teresa Hills). Tower #2 is right in the middle of Downtown on Santa Clara and Market. KT Properties is planning a $75 million, 22-story apartment building with 485 units. There will be 6,000 sqft of ground floor retail and two floors of underground parking. I'm really excited about this location as it is the first residential high-rise on Santa Clara street and will go a long way to improving the conditions of Downtown's main avenue. It also will have the unique attribute of being only a 5-10min walk away from absolutely everything Downtown. Downtown renters will have some tough decisions to make when these next two building are up. Oh, and Sam Liccardo is implying there may be even more to come. San Jose is gaining 336,000 sqft of office space along with 1,250 jobs thanks to the relocation of two corporate headquarters. LSI is moving 850 employees from 3 Milpitas offices into a single 220,591 sqft building in North San Jose. The target for the move is Q1 2013 and the plan includes adding 25,000 sqft of additional space in the future. Advantest is bringing 400 workers to a 116,000 sqft building on Zanker from current locations in Santa Clara and Cupertino. This move is happening right now. Imagination Design Works Nominated for 'Top Haunt' in the World! Congratulations to the Imagination Design Works Special Events team. After personal review by members of Top Haunt magazine, we are proud to announce Winchester Mystery House "Fright Nights" as one of the top 20 haunted Halloween attractions in the world! On behalf of Imagination Design Works we would like to thank our family, friends and staff for making last year’s inaugural Winchester Mystery House Fright Nights a success! We are grateful for the opportunity to have brought a new Fall offering to the property and we are thrilled to make it an annual hit. There is no way this kind of production can happen without the dedication of numerous people. The months of preparations and long hours of execution is a truly commendable feat. That being said, we need the support of our fans for the opportunity to be selected as one of the Top 13 Haunts. As an Official Selection, voting begins Sunday, July 1 and ends Friday, August 31, 2012. Winners will be announced on Saturday, September 1, 2012. Winners will be determined and ranked by popular vote and votes are limited to one per day. For more information about Top Haunt Magazine or to vote, please visit: www.TopHaunts.com. Scare-Zone - Best Maze of 2011: "This haunted attraction has captured the elusive magic of Halloween in a nearly perfect way." NBC News (think this was a local NBC blogger) - "This is a classic Halloween haunted house. At a house said to really be haunted. Yeah, that's awesome." Last Doorway Productions - "I must say the WMH Fright Nights is one thing to put on your list of things to do for the month of October. This is a must!" The San Jose Blog - "I would go so far as to call this the most anticipated Halloween attraction anywhere in the Bay Area, and it did not disappoint." The Winchester Mystery House is a California State Historical Landmark (#868) and was designed and built by Winchester rifle heiress, Sarah Winchester. The attraction is one of the top tourist attractions in the world and has recently been honored with the following accolades: World's Most Haunted Places #2 Travel Channel; The Scariest Locations In America #3 HauntWorld Magazine; 10 Great Places To Get Spooked #5 USA Today. IDW Productions is an independent entertainment Production Company formed for the purpose of creating feature length motion pictures, television programming and live entertainment productions. The company is owned and run by Brett Tomberlin and is the creative entity behind this year’s Fright Nights. IDW has also announced a major feature film about the House slated to premiere in 2013. San Jose, CA. – Fashion Your Mind Organization is seeking to honor the STRENGTH, COURAGE, and POWER of cancer survivors and patients at its 3rd annual “Giving to Live” 5k non-competitive run/walk fundraiser in South San Jose, CA at the Almaden Lake Park on July 14, 2012. In September of 2009 Ms. Mays’ mother loss her battle to a rare cancer type and since then Ms. Mays’ has been dedicated to supporting cancer patients on their journey to wellness along with raising awareness to the importance of cancer screening and early detection. The 5k-run/walk-course route follows the Los Alamitos Creek trail connected to the 32 acres of lake, hike, and bike in the Almaden Lake Park. The paved trail will take you by scenic agricultural lands and riparian communities. Registration is now open. Early registration is $25 for each participant and $10 for children age 10 and under. All donations and proceeds will be going towards cancer patients’ health related costs, such as: medication, living expenses, transportation, supportive services, and home care. Walk or run, but come…to the 3rd Annual “Giving to Live” 5k-cancer run/walk fundraiser for cancer patients and survivors. Visit http://www.fymo.org or http://on.fb.me/f-y-m-o for more information or to register for the race. Follow Fashion Your Mind Organization on Twitter at FashionYourMind. Fashion Your Mind Organization (FYMO) is a Non Profit 501 (c) (3) Corporation. Our mission is to support cancer patients on their journey to wellness. Each year, our vision grows as does the need to provide a better quality of life to cancer patients. By promoting healthy living and the importance of early cancer detection we hope to decrease the lives loss to cancer in our community. 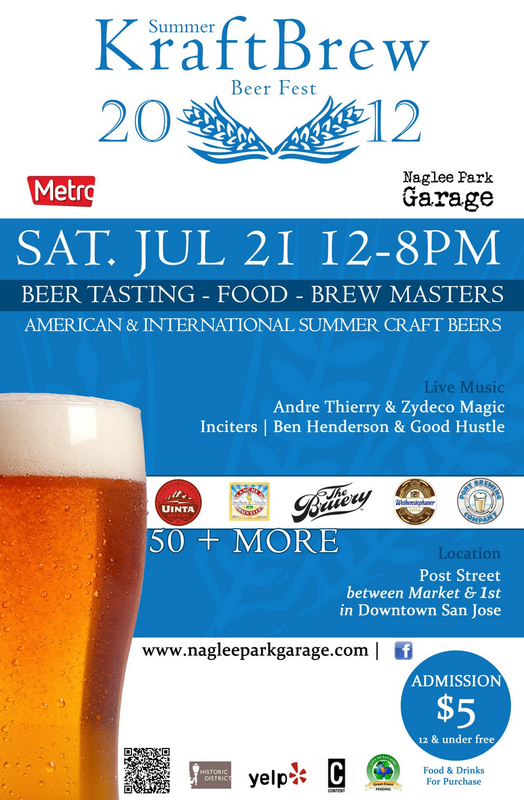 Next week Beer-fans can rejoice, the Summer KraftBrew Beer Fest is happening in Downtown San Jose! On Post St. you will be able to sample an insane number of craft beers while enjoying live music. This is the perfect location, which is a stones-throw away from Good Karma (phenomenal selection of craft beers), A Perfect Finish, San Jose's own Gordon Biersch, and Original Gravity Public House. That last one is my most highly anticipated new Downtown restaurant/bar this year and you will definitely have to check it out when it opens. Also don't forget to have a look at the BetterBeerBlog for full coverage of Summer KraftBrew 2012. This year is Santana Row's 10 Year Anniversary. In honor of the occasion, they are planning a few "upgrades." 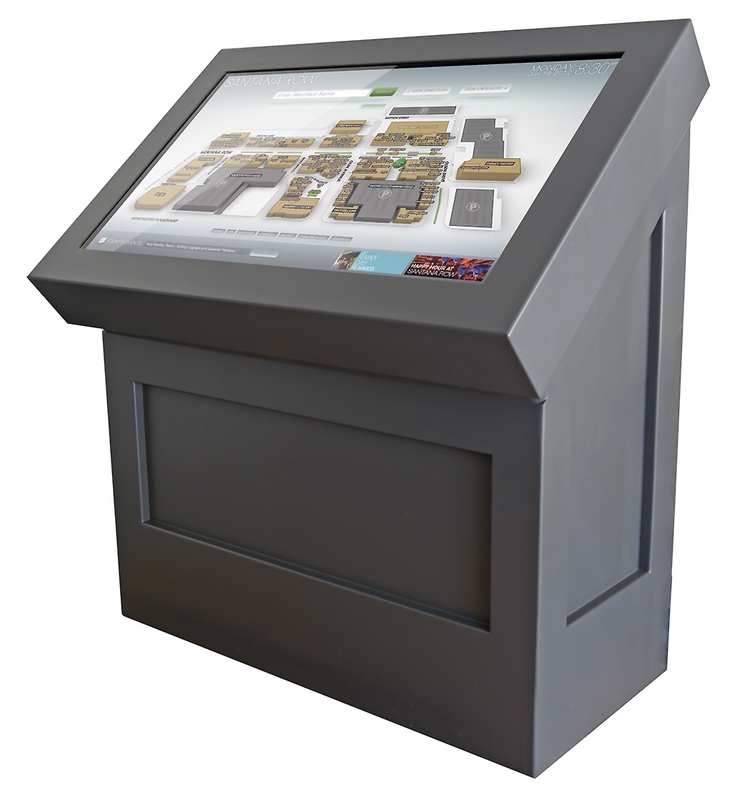 Santana Row is the very first Northern California location to launch a next-gen outdoor touchscreen directory. In fact, this may be the best outdoor touchscreen available anywhere. Think of this as a giant 46" HD iPad with an interactive map, way-finding (navigation), and constantly updated SR events. It's also fan-less, weather-sealed, and designed for use in direct sunlight. The technology and programming powering the massive touchscreen was actually developed in San Jose by Array Interactive. To check it out for yourself, just head over to Santana Row between Sino and Left Bank. San Jose is Getting a US Patent Office! In 2010 a staggering 10,074 patents were filed in the San Jose metro area, far more than any other region in the United States. 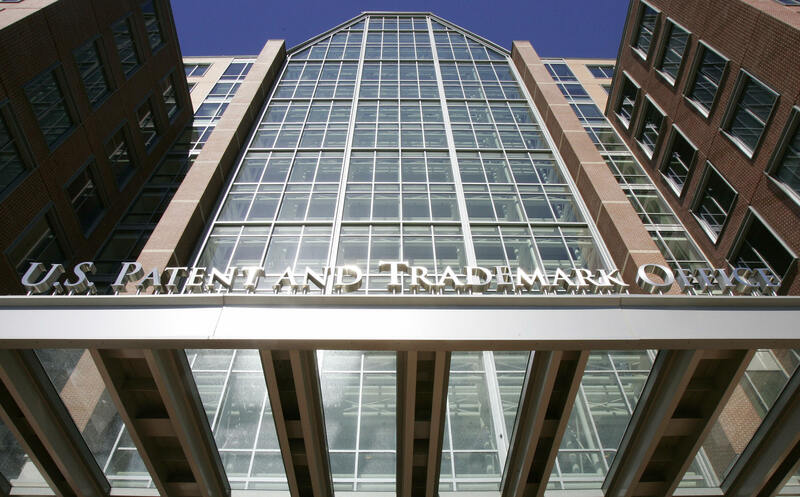 By comparison, the New York metro (with 8 times the population of San Jose) only filed 6,383 patents. San Francisco came in 3rd place with 6,290 patents. What is crazy, is that anyone who wants to meet with their patent examiner has to fly to the sole US Patent Office in Virgina. To top it off, there is a three year backlog on processing patents. Finally, last year it was decided that the US Patent Office would start opening satellite offices. Out of 600 applications, San Jose was one of the few areas chosen for one of these offices -- although based on the numbers above I think this should have been a no-brainer. The end result is that Silicon Valley innovators will be able to file and process their patents faster, more conveniently, and at a lower cost. The office will open in 2 years and employ 150-200 patent examiners, which will likely specialize in technology. Sounds like a huge win for San Jose. San José, CA – June 18, 2012 – Summer is a good time to have an adventure, and History Park will provide the backdrop. Gold Rush Adventure Day will allow families to be a ‘49er for a day---as in the original gold rushers of 1849---Sunday, July 15 from 11 a.m. to 4 p.m. There will be family activities, including panning for gold, cowboy grub (food available for purchase) and good old-fashioned music. Other activities will include the hand car, trolley rides, pony express relay and the Wells Fargo Stage Coach will be available for photo opportunies. The second of the series of Family Days will be on Sunday, August 12, Happy Birthday Car 124!, a celebration of Trolley #124’s 100th birthday party. This signature red trolley will be running on its track, there will be a horse car, and hand-car rides will be available. The newly-acquired caboose will also be featured. Vintage vehicles on display will include fire engines, an electric car, and Model T’s. There will be choo choo crafts for the kids, live music featuring the Peninsula Banjo Band. And what a birthday party! Even the San Jose Giants will celebrate. Party-goers can stay, picnic and watch the fireworks after the baseball game. Food typical of the Gay Nineties will be available for purchase. The following week, Sunday, August 19, is the annual Fandango at Peralta Adobe, in the heart of the new San Pedro Square Market. This date is signifant in that it commemorates the death 161 years ago of Maria Luis Peralta. He was the Californio who lived in the Peralta Adobe with his family, and was one of the first Accolades (mayor) of Pueblo de San Jose de Guadalupe. Typical of that era, there will be music and dancing, as well as a descedant of the original horses that were brought by the Spanish explorers. 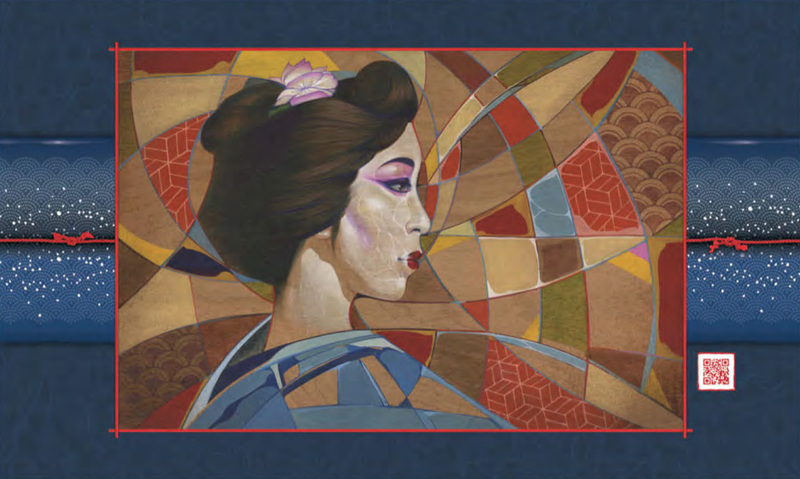 On Saturday, October 13 the last in the series of Family Days, is Filipino-American Heritage Day, celebrating Filipino American Month and to honor the current exhibit, Through My Father’s Eyes. That celebration will include filipino foods, dancing and music, and other activities. The series of Family Days at History Park is supported, in part, by a Cultural Affairs grant from the City of San José. · the Heritage Holiday Tea is on December 1 at the Fallon House. General admission is $8 per adult, $5 for seniors and students with a valid ID and children under five are free. Admission is free to members of History San Jose. MetroMarks is a city-based bookmarking platform and travel companion featuring links to city guides, news, and local events. They have recently added a section for San Jose and lo and behold, The San Jose Blog is sitting in their very first slot! The icing on the cake is that my favorite local blogs are there as well. Have a look over here. San José, CA --- June 18, 2012 --- San Jose Taiko draws inspiration from the digitally-driven Silicon Valley for its “Rhythm Spirit 2012” production September 21 and 22. The company will be at an exciting new venue this year: the School of Arts and Culture at the Mexican Heritage Plaza. SJT will also partner with the Zero1 Festival to explore the art form of taiko through the medium of digital expression. The production can already be enjoyed by audiences, as SJT shares the process of merging the traditional with the technological. “We hosted a number of ‘playdates’ with specialists in various technological and scientific fields with the intent of bringing the audience along on this journey. The playdates are meant to be freeform idea jam sessions, where we explore possibilities without fear of failure or worrying about whether it would fit into a typical San Jose Taiko production,” explains Artistic Director Franco Imperial. To date, playdate topics have included the sonification of seismic data and use of the Xbox360 Kinect Sensor. Idea partners range from PhDs from the USGS (United States Geological Survey) in Madison, Wisconsin to the software hacking community in San Francisco. There are three performances of Rhythm Spirit 2012: Friday, September 21 at 8:00 p.m. and Saturday, September 22 at 2:00 p.m. and 8:00 p.m. All shows will be held at the School of Arts and Culture at the Mexican Heritage Plaza, 1700 Alum Rock Avenue, San Jose, CA 95116. Tickets are $25 for adults and $20 for students and seniors if purchased in advance ($30/$25 at the door). All seats are reserved, and group rates are available. Ticket information is available by visiting www.taiko.org or by calling 408-293-9344. San Jose Taiko, with a deep respect of cultural traditions and a commitment to artistic excellence, is dedicated to the advancement of the taiko art form through the development of its world-class Performing Ensemble and the San Jose Taiko Conservatory. Located in the heart of Japantown of San Jose, the company performs throughout the Bay Area, the United States and abroad. Since 1973, San Jose Taiko (SJT) has integrated this historical Japanese art form with other world rhythms. All compositions performed by SJT are written or arranged by members of the group. Composing, choreographing, designing and producing costumes, and handcrafting of the drums are part of the holistic process in which all members participate. Through this singleness of mind and spirit, harmony is achieved and the music rings with unity and clarity. Enrich the human spirit. Connect people beyond cultural and demographic boundaries. The solar energy market is continuing to gain traction in San Jose. Gen110 has recently issued a press release announcing that they have completed solar installations in over 1,200 South Bay homes. What is especially interesting is that one of those 1,200 is a Ida Perracci's house in Alum Rock. She decided to have solar installed on her 100th Birthday (!) ... I guess it's never too late to go green. Check out the full release below along with a photo of Ida. San Jose, Calif., June 13, 2012 - Gen110, the leading distributed electricity company, today announced it has brought cost-effective distributed power to more than 1,200 households in the South Bay in the form of solar electricity. The company now powers more than 40 percent of solar installations in the San Jose metropolitan area, California’s third-biggest solar market. Gen110’s approach helps energy-intensive households lock down higher-tier energy rates while avoiding rate hikes prevalent to South Bay power customers. By providing access to the best technologies and financing solutions available with a low upfront investment, Gen110 helps customers save approximately $50,000 over twenty years on their energy bill. 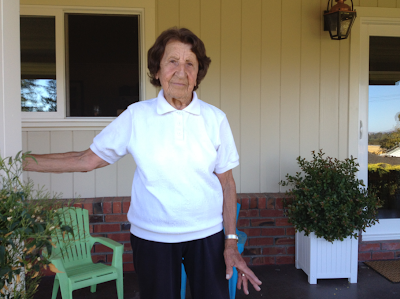 For many of the region’s retired residents living on fixed incomes, this spells opportunity: 100-year-old Ida Perracci of Alum Rock was one of the first to recognize its potential benefit to her wallet and the environment. Perracci signed on to install a Gen110 power plant on her home on the day of her centennial birthday party, locking into predictable energy rates starting now. on Facebook (facebook.com/Gen110) and Twitter (twitter.com/gen_110). 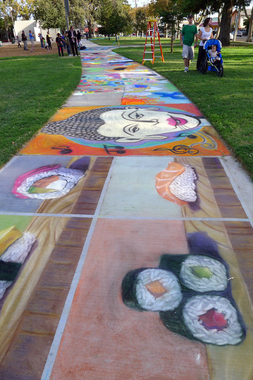 In preparation for the 5th annual Luna Park Chalk Art Festival on September 22, 2012, there will be a FREE chalk art workshop featuring 3D chalk art with expert street painters Wayne and Cheryl Renshaw. Happy 4th of July San Jose! The closest thing to an official fireworks show we have this year is happening at the San Jose Giants stadium around 9:30pm. If you are a History San Jose member, you can watch the fireworks for free from within their venue. You might also be allowed to watch for free at Kelley Park next to History San Jose. Hope you all have a fun and safe 4th! 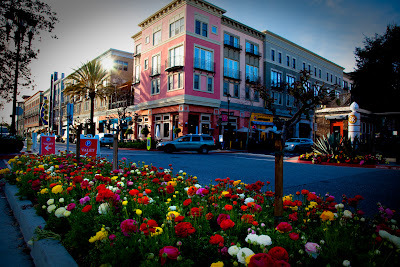 San Jose, CA (June 19, 2012) - Summer is in full swing at Santana Row with music, shopping specials, stimulating activities for children and a festive way to wile away the day before fireworks begin on the 4th of July. Slated for July: Flavors of Jazz, July 4th Summer Block Party, Mommy & Me, Opera San Jose on Bastille Day and the opening of kate spade new york. a wide range of styles, from traditional and contemporary jazz to funk and Brazilian beats. When: Tuesday evenings, 7 to 9 p.m., July 3-August 28 on the patio of the various restaurants. includes food, fashion and fun. Salon, mimosas at Flying Lizard and wine tasting at St. Croix. (beef or vegetarian) while listening to live music. Discovery Museum “Wild Animal” games. call 408.551.4611 or visit www.SantanaRow.com. Callon (tenor), Zachary Altman (baritone), Evan Brummel (baritone) and Silas Elash (bass). more information about Opera San Jose, visit www.operasj.org. same day receipts at the Santana Row Concierge Center. San Jose location. It is located at 355 Santana Row next to Hotel Valencia. Bill W. and Dr. Bob 6: (l to r) Bill Wilson (Ray Chambers) and Dr. Bob Smith (Robert Sicular) meet and talk for the first time in what is now known as the first A.A. meeting in San Jose Rep’s West Coast premiere of Bill W. and Dr. Bob. 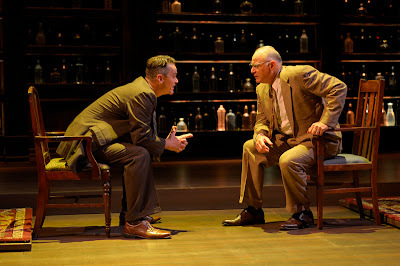 Last week I attended Opening Night for the San Jose Repertory's last show of the 2011-2012 season, Bill W. and Dr. Bob. It is based on the true story of the founders of Alcoholics Anonymous and their wives. Usually I lean toward musicals however, the subject matter was intriguing and ultimately drew me in. When I arrived at the press desk I chatted a bit about the show with Laura (Marketing Manager for the Rep) and Elisabeth (PR contact). Laura mentioned the set design and that there was an interesting element to it. Now, set design is one of the things I really like to focus on at any kind of show, so I was already intrigued. Then she added, with a smile, that I should try to count the number of bottles the set designers put in the scenes. After my guest and I found our seats, I glanced up at the set and immediately understood what Laura was hinting at. Let's just say there were quite a few bottles to count. You really should see it. I'm sure you could just check out the media photos on the Rep's website (the one I used above for example) … but it's better to just see it in person, mmkay? The show… wow. Literally as the show ended, I turned to my friend and after a moment, blinked and slightly shook my head and said "wow." The show is moving and holds your interest all the way through. It deals the battle with alcohol the two men have in their lives, the wear and tear it does to their relationships, and the struggles they have internally about their disease and the deep-down honest want for healing they both seek. I've never been to a show with such a powerful and moving story. And to know it's a true story makes it all the more amazing, really. The actors portraying Bill W. and Dr. Bob are fantastic. I was particularly mesmerized by the acting of Ray Chambers (Bill W.) -- from the powerful anger-fueled outbursts to the sly, humorous moments, glances and comedic timing - he was fantastic. Two of the actors, Cindy Goldfield and Mike Ryan, were amazing! They'd run off stage to dress up as yet again another character. Mike Ryan played about 11 different characters throughout the show. Insane! Like I mentioned earlier in my post, the main set features some bottles, of which you just have to see it in person. It's a unique way to decorate the set. The rest of it involved moving pieces, a dining room table, or living room chairs float out from the sides of the stage when needed. Since storyline and acting is the main focus, the set design helps to remind you the setting without overpowering the scene. In general the costumes for the men were pretty typical of the era. Stylish suits and even an argyle sweater (think old-school golfing style) were nice, but the one thing that stood out the most to me…. the women's SHOES. I want to own all of them. The blue and white heels Lois wears in a few scenes were so adorable! Another pair, worn by Hen, were off-white with periwinkle blue tips. I have always loved the clothing of that era and while the dresses were not necessarily great in terms of the fabric patterns, they felt very true to life. Espeically for the Wilsons, they did not have a lot of money so fabric wasn't going to be super fancy designs. Anyway, that's my take on it at least. If you've ever been curious about what Alcohol Anonymous is and how it came to be, this is a show for you. Get a little history lesson in. There's some humor, some sadness, and hope throughout the entire show. If you or someone you know has battled alcohol addiction, I'm sure you'll find it just as interesting and accurate. Some observations about the audience reactions; when Bill, after a short sober period, opts to take a shot in celebration of Armistice Day, the audience gasped with exasperation. He was clearly fighting the idea, but couldn't resist temptation. Toward the end, during a few particularly moving scenes (I've never seen an actor on stage really cry, but I suppose sitting so close to the stage helped), during the quiet moments you can hear the audience sniffling. No doubt there were many people in attendance that have gone through similar situations - whether as the one who has/is battling such a disease or a loved one who has been on the other side. I've only read one other review so far. That particular reviewer said the show wasn't "life-changing", and while yes everyone has different experiences... I just can't help but feel that because of so many eye-opening, dramatic, and emotional moments this story has that one can walk away not feeling moved. This quick-witted and honest docu-drama follows two dynamic and dedicated men who, in the midst of their battle with acute and debilitating alcoholism, formed a formidable and historic alliance to help others combat the same addiction. Bill Wilson, a stockbroker who crashed with the stock market, finds himself in a bar. He could have pursued any number of distractions–a game of solitaire, reading a book–instead he chose to make a phone call. Through an astonishing series of events and bitter humor comes the inspiring, true story of the founders of Alcoholics Anonymous and their wives.